As mentioned in a previous blog, I recently finished Eric Metaxas’ pulse-racing biography on Dietrich Bonhoeffer. The parallels between what this Christian martyr faced just a few decades ago in a western nation and what the United States is facing today are undeniable. National Socialism was simply applied Darwinism – the Nazi’s T4 program bears a terrible resemblance to our current abortion shame. Our present media climate, which regularly omits, suppresses, or distorts that which does not advance a particular agenda, has a creepy predecessor in Josef Goebbels. The response of the church when Hitler rose to power was a mixed bag. Instead of solidarity – boldly opposing the National Socialists’ early signs of Antisemitism – many church leaders cowered in the pulpits, and their parishioners followed suit. Many pastors were naively excited for the changes Hitler promised. The group known as the Confessing Church, Bonhoeffer among them, was among the minority that immediately discerned what Hitler was and had the courage to take a stand. There was a significant faction of the church calling themselves the German Christians, which was anything but Christian. This group wished to form a compromise between what was happening in the political arena and the church. They banned converted Jews from attending services, repudiated the entire Old Testament and the Pauline letters, and even carried along the insane notion that Jesus was somehow Aryan. 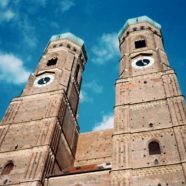 The so-called German Christians have a counterpart in the American church today. Wishing to “fit in” with the trends in the secular culture surrounding them, the Compromising Church calls itself “tolerant” and refuses to acknowledge certain sin as such – it is, after all, too polarizing and might be seen as unloving, judgmental. The compromising church shifts awkwardly when asked if Christ is “the only way” to know God because this is politically incorrect, arrogant even. The Compromising Church dislikes preaching repentance; it might make individuals uncomfortable. And the blood of Christ? Who wants to hear about blood – that’s gross. It is better to focus on social justice and serving the less fortunate. There is enough common ground in this with the world not to ruffle anyone’s feathers. The Germans have a phrase: “so faengt es immer ein” – “it always begins the same way.” This is because everything is spiritual, and what happened in Germany was spiritual. What is happening in the United States right now is spiritual. To think that we are beyond or immune to a similar fate as Germany under the Third Reich is to be naive to the workings of the Enemy. “For the weapons of our warfare are not of the flesh, but are divinely powerful for the destruction of strongholds” (2 Cor. 10:4). Among the weapons the church can use to fight with today against the strongholds of our nation are prayer (united with faith), truth (spoken in love), righteousness (which the world can’t help but notice), worship (which attracts the Holy Spirit), and love (to which no one is immune)….all the while worshiping God in spirit. It is wrong and it is terrible to think that we are powerless as the church against the darkness in the world. “The gates of hell shall not prevail against it” was the promise of Jesus! Children as human shields: benefiting them or benefiting from them?